SCVHistory.com LW3255 | Lebec | Hilltop View of Hotel Lebec and Adjacent Buildings, 1921-1923. 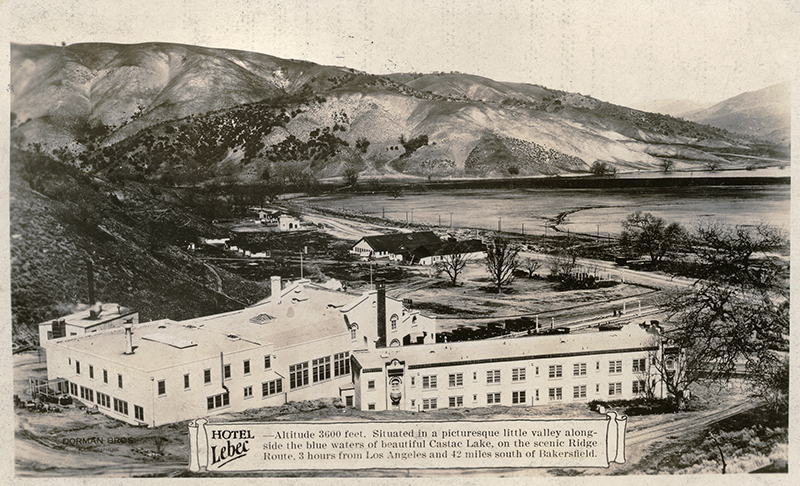 Hilltop view of Hotel Lebec, real-photo postcard, 1921-1923, by Dorman Bros. of Bakersfield. Same series as this view. 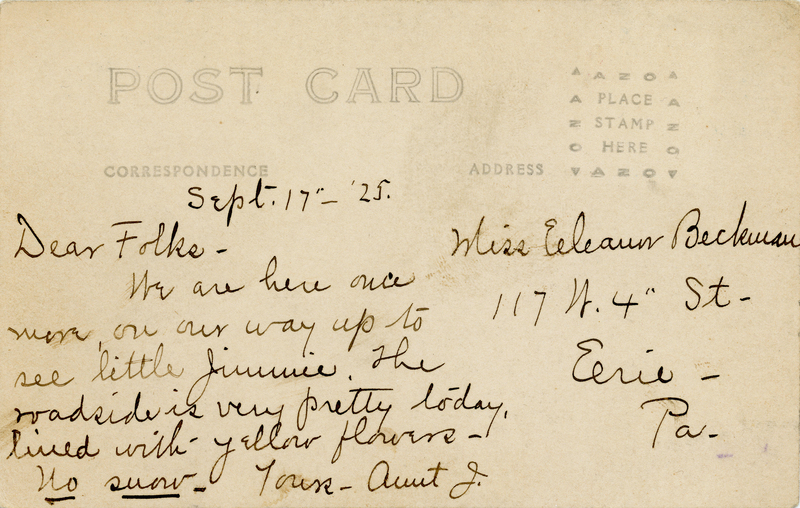 The postcard is addressed to Miss Eleanor Beckman of Erie, Penn. Glue residue shows a postage stamp was affixed to it at one time, but it was not canceled. A handwritten message on the back is dated September 17, 1925, but the image itself is a bit older — no earlier than 1921, when the hotel opened, and no later than 1923, when most of the other buildings in this photograph burned down. We are here once more, on our way up to see little Jimmie. The roadside is very pretty today, lined with yellow flowers. No snow. The book, "Lost Hotels on California's Ridge Route" (Harrison Scott 2007), includes a copy of this RPPC, along with a substantially similiar view that is probably a different strike of the same photograph. Scott identifies the other print as 1922. Visible in the middle of the photo are the wood-frame general store, lunch room and auto garage that Thomas O'Brien, a saloon keeper from Bakersfield, built in 1915 when the Ridge Route Highway came through. He also built 25 cabins (ibid.:6-9). Collectively, these comprised the original Lebec Hotel. Photographic evidence shows the cabins were still present while the lavish new Hotel Lebec was under construction in 1919-1921, but most of them had been removed by the time the hotel opened May 21, 1921. Only a handful remained; they are visible here, to the viewer's left of the commercial buildings. We don't know what is under construction to the viewer's right of the commercial buildings. 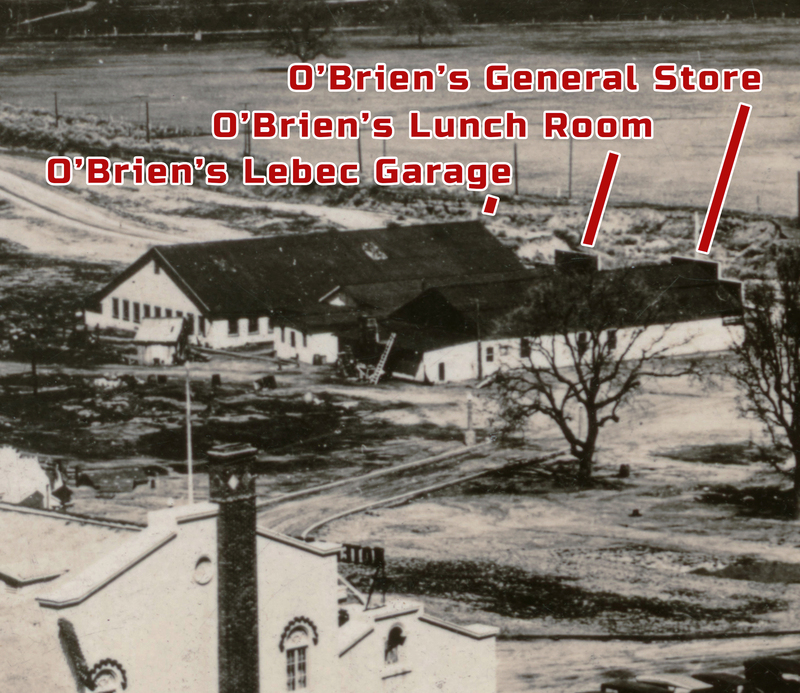 O'Brien had sold the new hotel and adjacent buildings to Foster Curry, son of the concessionaire at Yosemite, by November 1923, when all of the wood-frame commercial buildings and most the cabins burned down. "Curry had not attended to cleaning the grease from the restaurant's flue on a regular basis," Scott writes (ibid.:9). Taking the place of the wooden commerical buildings was a new rock structure housing a coffee shop, bar, grocery store, post office, Richfield gas station and an extensive garage (ibid.). Visible at far right, just above the centerline, is the tree-lined edge of Castac Lake, aka Castaic Lake. Castaic Lake is a natural water body in Lebec, not to be confused with the manmade Castaic Lake Reservoir that came decades after this photograph was printed. Altitude 3600 feet. Situated in a picturesque little valley alongside the blue waters of beautiful Castac Lake, on the scenic Ridge Route, 3 hours from Los Angeles and 42 miles south of Bakersfield. As of 2012, Kern County has approved, and a federal court has upheld, a 3,450-home development project to surround the "real" Castaic Lake at Lebec. According to Henley's Photo of Bakersfield (accessed 2018), Charles F. Dorman, a photographer from The Denver Post, and his younger brother, Claude, began working at a haberdashery in Bakersfield in 1904. In 1907 they went into business with John B. James and formed James & Dorman, a portrait studio at 1677 Chester Avenue. The partnership dissolved in 1911. The name changed to Dorman Bros., same address, while James opened a studio elsewhere in Bakersfield. The brothers split up in 1928. Claude, the younger brother, stayed at 1677 Chester Avenue but changed the business name to Dorman's Photo Shop. Charles opened his own studio at 1724 Truxton Avenue. Charles died in 1935. Claude sold Dorman's in 1945. It changed hands again in 1946, 1947 and finally in 1948 when it was purchased by Joe and Ann Henley. Claude Dorman died in 1950. In 1954, Joe Henley formally changed the name from Dorman's Photo Shop to Henley's Photo Shop. Henley's opened a second shop in 1962 and moved in 1977 from its original location on Chester Avenue, where the Dorman brothers started out, to the company's present (2018) location at 2000 H Street in Bakersfield where it is owned and operated by the former Henley's sales manager, Jimmy Bunting and family. LW3255: 9600 dpi jpeg from original photograph purchased 2018 by Leon Worden.